As ironic as it may seem, Henry Ford—the man who revolutionized the automotive industry and enabled the "common man" to afford his very own vehicle—actually helped halt a highway project in the Upper Peninsula of Michigan. In the end, the personal desire of one man, one very influential man, weighed more heavily than those of the public at large. But first, some background. When the first state trunklines were laid out in the second decade of the twentieth century, very few state-maintained roads ran along the Great Lakes shorelines. In fact, most roads ran well inland of the 'big lakes.' In the 1930s the State Highway Department began a program of determining shoreline routings for much of the Great Lakes coastline around the state on both peninsulas. Several portions of these lakeshore routings were built, such as US-2 between Naubinway and St Ignace and US-23 between Au Gres and Cheboygan. In 1919, the State Highway Department designated a new trunkline route—given the M-35 route number—to run northwesterly from the Negaunee area through the Huron Mountains of northwestern Marquette and northeastern Baraga counties, then southwesterly along the Keweenaw Bay shoreline to L'Anse. At that time, this area was only served by logging roads and two-track trails. This new trunkline would not serve any major population centers, only the small hamlets of Big Bay and Skanee would be situated within a few miles of the new highway. Iit can be assumed this route was designated more to serve a relatively isolated area and bring another highway closer to a stretch of Great Lakes shoreline. While M-35 from Negaunee to L'Anse via the Huron Mountains was officially "determined" as a state trunkline in 1919, it was not until 1926 that work was completed on a major portion of the route in Marquette Co and from 1928–32 saw similar work completed on the Baraga Co portion. The middle of the route—the segment through the Huron Mountains west of Big Bay—saw very little work performed, if any. Since this was one of the most challenging parts of the route, it could be assumed the State Highway Department decided to approach the mountains from both directions, eventually meeting in the middle, thus completing the route. During this time period, the route of M-35 on official state highway maps issued by the MSHD showed the highway with a dashed line and the label "IMPASSABLE." One major task completed early on was the bridging of the Dead River northeast of Neguanee. Interestingly, the bridge used not only previously spanned a different river, but one in a completely different state! According to MDOT, the State Highway Dept bought the bridge in 1919, had it disassembled from its location in Pennsylvania where it crossed the Allegheny River upstream from Pittsburgh, and transported to Marquette County. In 1921, the MSHD erected this 271-foot long, one-lane span across the Dead River. 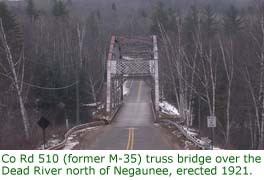 The so-called "Steel Bridge" carried Co Rd 510 (the successor route to M-35) across the Dead River until bypassed by a newer structure in 2010. The Steel Bridge survived a catastrophic flood in May 2003 when a dam upstream burst. Several other Dead River bridges were damaged or washed out, but this span survived with water coming within inches of its deck. The Steel Bridge is now closed to vehicular traffic, but remains opens for pedestrians and non-motorized transportation. Backtracking about four decades, a group of wealthy investors from nearby Marquette as well as similar men from Detroit and Chicago purchased a massive tract of land in northern Marquette County on the shores of Lake Superior northwest of Big Bay. This 24,000-acre tract was intended to be a private, membership-based hunting and fishing preserve. The club limited membership to only 50 primary members (those who are allowed to own their own cabin) and 80 "associate" members (not allowed to own a cabin), which resulted in extremely limited and exclusive membership. In the 1920s, Henry Ford himself wanted to become a member of the Huron Mountain Club, but since the membership roster was full, Ford was forced to wait until a club member either resigned or died. Obviously, a long waiting list meant even Ford might be forced to wait years to gain membership, if ever. Ford needed to stack the deck in his favor to ensure he was able to become a member of the HMC as soon as possible. By 1927, the State had completed the initial work along the route of M-35—route grading and installation of drainage structures—all the way to the Salmon Trout River on the southeast edge of the Huron Mountains. As noted above, Ford owned large tracts of land in nearby Baraga County as well as in northern Marquette County. To help his cause—that of gaining membership in the Huron Mountain Club—Ford purchased additional acreage in Marquette County adjacent to the HMC holdings including land along the proposed route of M-35. Ford worked to stop construction of the highway through his holdings and, according to local author and historican Fred Rydholm, an Attorney General's opinion helped seal the fate of M-35 though the Huron Mountains. Further construction on the incomplete portion of the highway through the Hurons was halted and, within a decade, the entire route of M-35 from US-41/M-28 (between Negaunee and Marquette) to US-41 at L'Anse was removed from the state trunkline system. 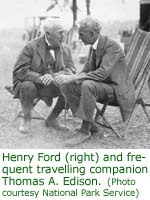 Due to his assistance in getting the state highway skirting the southern egde of the Huron Mountain Club cancelled, Henry Ford was granted his full-time membership in the HMC. He then hired Albert Kahn to design then build a $100,000 "cabin" which, in 1929, was a large sum! Oddly enough, Ford's wife, Clara, was unimpressed with the "cabin" and the Fords left the Club not long after. The cancellation of all of M-35 between Negaunee-Marquette and L'Anse left two widely-separated segments of the highway remaining. M-35 began in Menominee at the Wisconsin state line and proceeded northerly through Escanaba and Gwinn to Neguanee, where it was now severed from the remaining section beginning at L'Anse-Baraga and continuing westerly to US-45 near Rockland. The two discontinuous segments of M-35 were separated by approximately 65 miles, via highway. This discontinuity was seemingly rectified in the 1950s when the portion of US-41 and M-28 from Negaunee to L'Anse was concurrently designated with M-35. This resulted in a three-way concurrency of US-41/M-28/M-35 between Negaunee and central Baraga County east of Covington. The new concurrent designation is shown on official highway maps for the first time in early 1953, however it is unclear whether M-35 signs appeared along that route prior to that time. A state trunkline log dated January 1948, however, lists M-35 as being a two-segment, discontinuous highway supporting the fact the gap was not signed until after that time. Today, no navigable road exists through the Huron Mountains along the line of the proposed M-35 from the 1920s and 30s, not even a two-track trail. In fact, only one generally passible road through the area exists north of US-41/M-28 travelling through the Yellow Dog Plains to the south of the main Huron Mountain range. That route, utilizing Triple A (AAA), Ford, Northwestern and Erick Roads, provides access to the constructed portions of the proposed M-35 route. 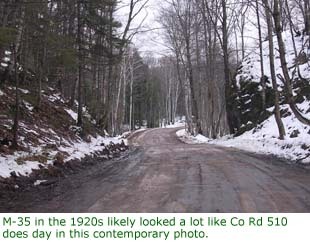 From the Marquette-Negaunee area, the former M-35 route exists as rather well-maintained Co Rd 510. From Co Rd 502/Midway Rd just off US-41/M-28 northwesterly for about five miles, it is a two-lane, paved road while the next 19 miles is two-lane gravel-surfaced. Approximately 25 miles north of US-41/M-28 at its intersection with Triple A (AAA) Rd, Co Rd 510 turns northeasterly toward Big Bay and the former M-35 route continues northwesterly as a road called "Blind 35" on many maps. Blind 35 continues for approximately four miles, with the quality of the road decreasing gradually over that distance. It is navigable by a passenger car in ideal conditions, while four-wheel drive and higher ground clearance are needed in poorer conditions, as the road is not actively maintained. Field trips to the area by the author in September 1999, November 2003 and September 2015 showed much evidence that the route was to be a full-blown state highway. The route itself has a very nice grade with long, sweeping curves—the type one would find on a state trunkline—in addition to longer straight segments, uncommon for minor backroads and two-tracks in remote country. Two-lane wide concrete culverts and small bridges span several small streams, again, another sight not normally present on backcountry roads such as this. It also seems as if some rock cuts into the side of a hill were made for this highway as well. Map of Never-Built M-35 through the Huron Mountains - an overview map of the area noted in this article. County Rd. 510 / Dead River Bridge - from MDOT, with details on this "rare Pennsylvania through truss highway bridge." Steel Bridge on Marquette County Road 510, Michigan - photo of Marquette County Road Commission snowplow crossing the then still-open Steel Bridge. Blind 35 - a great photo of "Blind 35" on Panaramio. Return to the South Blind 35 Mountain - a blog posting on Jacob Emerick's Blog about hiking in the Blind 35 area.